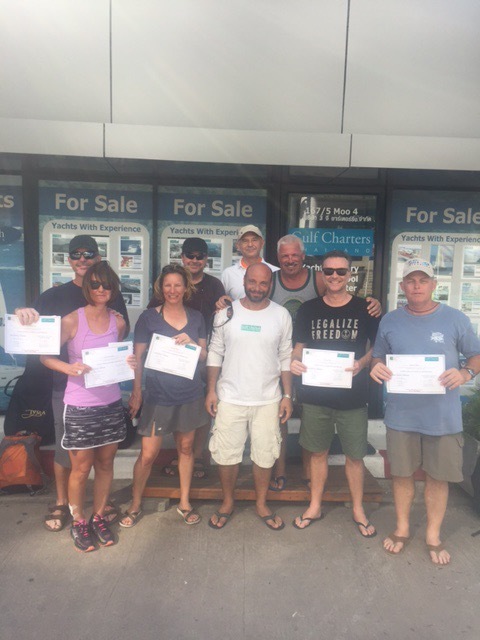 For the last two weeks, we have been completely focused on learning how to sail and obtaining our international skipper licenses with Gulf Charters and International Yacht Training (IYT) organization in the Gulf of Thailand. (http://www.yachtmasterthailand.com/index.htm). It has been a challenging and rewarding two weeks learning the language of sailing, studying the theory and sailing. We have spent most of the time on a 43 ft Beneteau with many full day trips, two separate overnight trips of different lengths, and a midnight sail to practice navigating at night. It all occurred in a busy bay full of fisherman, tourist water taxis, and a bunch of tankers (that are big and move much faster than you would expect). Two instructors from Sardinia- Nicola, a native Italian from the Venice area and Paul, a British expat living there for over 30 years. These guys have both been sailing for decades, crossed the Atlantic and other ocean crossings and have an unlimited supply of sailing stories and folk-lore. Their stories of lost fingers had me begrudging stowing my rings. And a drunk Russian that showed up with beer and new wounds every morning. We lost two members of the crew after the first few days to Koh Samui, a beautiful island where cocktails and relaxing on the beach is what one does. I must admit I considered following them more than once. The Russian disappeared after 10 days or so. His attendance was spotty at best and his drinking was creating some issues on the other boat. It was certainly an interesting mix of folks. The ICC was an introductory training program looking at basic navigation, sailing theory, terminology, knot tying, rope work, sail handling, yacht safety, etc. The IWC was another training module focused on knowledge of passage planning, charts and navigation aids, docking, anchoring, boat handling, collision regulations and first aid at sea. The Watchkeeper Certification also included an all day sail into the evening until about 10 pm. Motoring at night is challenging, especially here in Thailand. There are many fishing boats in the Gulf of Thailand and none of them follow international regulations- e.g. lights. Fishing nets and trash are abundant. Sailing in the area requires constant vigilance while underway. The ISC course focuses on seamanship skills, tides and currents, wind and weather, waves and storms and assuming responsibility for a yacht. At the end of each training module, a successful completion of a written exam was required in order to obtain certification. The two-week course included five nights at sea on the boat and roughly 257 nautical miles of sailing. Gulf of Thailand is a great place to sail as there are many islands here- Koh Samet, Koh Chang, etc. However, trying to sleep on a boat in the tropics with no air condition equated to sleepless nights at sea. For the watchkeeper course, we could have stayed on the boat in the harbor but opted for a hotel room at the marina with air conditioning. One of only 4 in the world. I think the Bentley we saw a couple times at the dock belonged to this boat. This is something Chris has always wanted to do having sailed small boats while growing up and sailed with a few friends in Seattle. For me, this was a little more of a stretch, and at the end of each module, I was toying with the idea of not starting the next. (I am not 100% comfortable on the water and found the boats restricting despite having enough space for individual cabins and bathrooms. It is so hot here unless the boat has air conditioning sleeping is painful in the heat and humidity). However, my wonderful parents taught me many great, life lessons including never quit. After two intense weeks, we are both now certified skippers allowing us to charter (rent) boats in many locations in the world….perhaps next year somewhere warm? Stay tuned! Thanks, Rachel. Best to you and Erick. Cheers. Thanks for the insight into the work it takes to obtain an international skipper license! My parents have friends who have done this and have considered it. 🙂 Sounds challenging, but worth the reword. Good for you – for not having skipped out once you docked near Koh Samui, lol!